SEO reporting: best practices you should know! SEO without measuring, reporting, and analyzing, is like flying blind: you may be moving, but you have no idea if you’re going in the right direction and if what you’re doing is working. That’s why we’ve assembled everything you need to measure your data, track your performance, and improve your SEO. It’s a whole wide world of SEO and SEO reporting, so if you need a good place to jump in and learn the best practices, this is it. Before getting into the details of the reporting aspect, it's important to understand why SEO is a crucial aspect of your marketing strategy, and what its basic principles are. SEO reporting provides you with the tools you need to know if all your efforts are worth it. But what exactly is a SEO report? how do you even start creating one? Not all SEO reports are created equal, and in some cases (like this one), looks are important. When you're creating you SEO report, here are a few important factors to always keep in mind. Manual reporting has its advantages (namely, near-infinite flexibility), whereas automated reporting gives you the gift of time and unbeatable efficiency. But which is right for you? Now that SEO reporting is at the top of your list of priorities, and you know how to go about creating your reports, you're ready to actually do it! But what should the finished product look like exactly? There are a multitude of SEO reporting resources out there that can help you better understand everything from Google's ranking factors, to which KPIs are important to track, to why SEO reporting is so crucial to the agency-client relationship. A great SEO report should be clear, concise, and appealing… basically, everything to make it easy to understand, useful, as well as fun to interact with. There are a near infinite amount of widget combinations and layouts you can use to build your perfect SEO report. Having a template, like the one shown here, can help you get started. The perfect SEO report should show each of your most important KPIs with widgets like these that display your data in ways that make sense to your audience. Once you’ve seen the bigger picture concerning all your online traffic, it’s time to get into the nitty-gritty of just your SEO performance. A Visits from Organic widget helps you see how much traffic is coming from Organic sources, and if it’s growing over time. Now that you know how much of your traffic is organic, you want to see through which page your traffic is coming…. The Organic Visits by Landing Page widget allows you to better understand which pages are being found through search engines, and which ones you still need to optimize! SEO is always evolving, and techniques to get to the top of the pack are constantly changing. Want to stay up to date with what’s going on in the world of SEO? Our blog has got you covered! SEMrush is one of the most powerful and extensive marketing tools on the market, with all the features you need for your SEO and SEM strategies. Our entire team is thrilled to announce that SEMrush is now officially a DashThis integration! 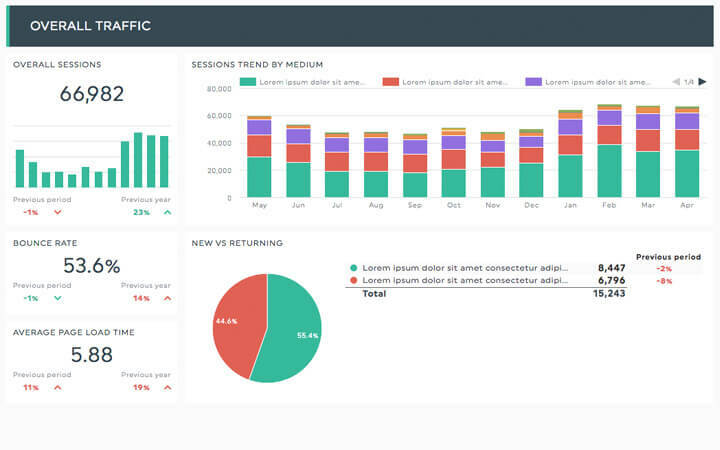 Neil Patel shared a great article on QuickSprout in which he presents what he sees as the 14 most important SEO metrics you should incorporate in your regular SEO reporting. Here’s our take on the subject! Is there an online dashboard you can use to report SEO performance to your clients? Yes, there is. A bunch actually! DashThis is one of them. The trick is to choose the right one or at least one that will fit your needs given the hundreds you’d have to try. Here are some guidelines to help you pinpoint the right tool for SEO Client Dashboards. We’ve already discussed how agency-client relationships can sometimes be more tenuous when agencies focus more on creative trends and technological expertise instead of just making their clients happy. Client reporting helps keep the lines of communication open between agency and client, helping make everyone happy! Ever been on a road trip where the driver has no idea where he (yes guys, it’s usually us) is going? Or looked at a car engine making some mysterious ticking noise without the slightest clue of what is actually wrong? Identifying the problem is the first step in solving the problem. SEO campaigns don’t work on a “set it and forget it” principle and typically take weeks or even months to bring tangible results. Precisely because of this slow results delivery time, the entire campaign needs to be based on specific goals and include precise metrics that help in assessing its performance. SEO reporting is not just about merging data and making it look presentable and understandable, but must be able to indicate real statistics, progress and allow for in-depth, useful analysis. It must be able to help reach organic search goals, show new opportunities and possible competition threats. What elements does a perfect SEO report consist of? Just a few elements can help you build the perfect framework around which you can create a great report! You know how you tend to stick on Tweets or Facebook posts that have images more than those that don’t? It isn’t just you. Now imagine if you could make someone stick on your web performance data as much as you stick on an image-laden Facebook post. Well, you can. Just make your data visual. You don’t need just one or two tools for your SEO strategy… you probably need a ton of them. And the secret to success is utilizing all of these tools simultaneously and thoroughly understanding how each of them can play off the others. Don’t know where to get started? Start with these! Want to see every other tool that you can plug into your awesome dashboards? You want both a custom design and a custom URL? There's a discount for that! 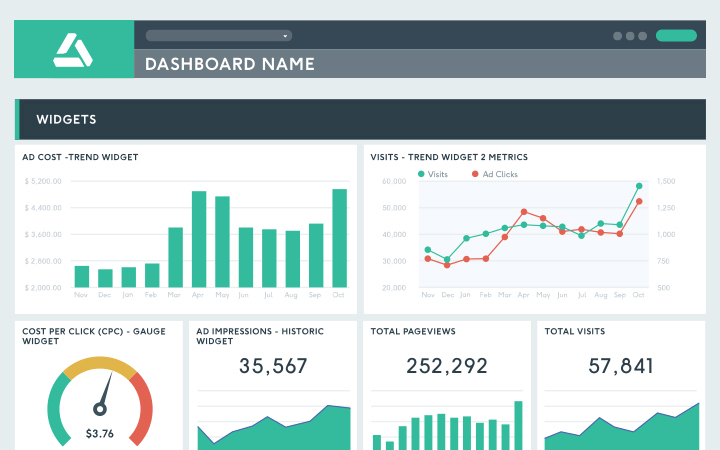 Ready to take your SEO reporting to the next level with a white label dashboard?